Unlike other social networks like Twitter and Facebook, Instagram only allow third party apps to publish posts automatically on behalf of users under specific conditions. 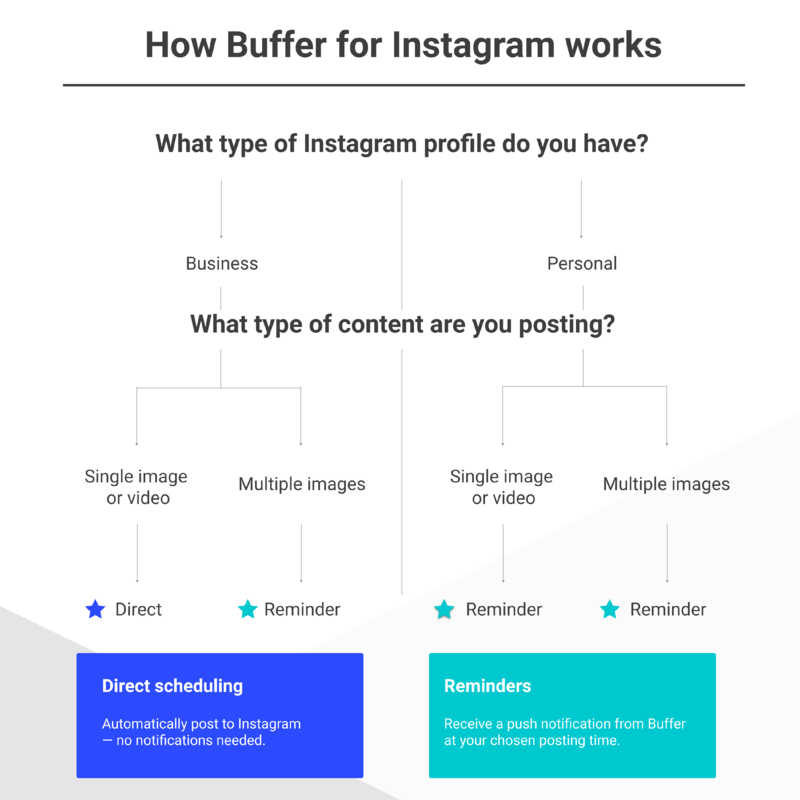 Therefore, Buffer Publish offers two ways of posting to Instagram: Direct Scheduling and Reminders. Scheduling Instagram posts works identically for both, but the type of Instagram Profile you're sharing to (Personal Account or Business Profile), as well as the type of content you're sharing (single image, multiple images, or video), will determine whether the post is shared automatically or scheduled as a reminder. Direct Scheduling: Single image or video posts, with or without a caption, being shared to an Instagram Business Profile, will be published automatically. It's important to note that images and videos must be within Instagram's accepted aspect ratio range, in order to be published automatically. If the image or video falls outside of this range, the post will be scheduled as a reminder instead. Additionally, videos must be at least 3 seconds and less than 60 seconds. Reminders: Any posts being shared to an Instagram Personal Account, regardless of the type of content, will be scheduled as reminders. Additionally, posts being shared to an Instagram Business Profile, which contain multiple images will be scheduled as reminders. The reminder will be sent as a push notification to your phone when it's time for your post to be published. Whenever you're scheduling a post, we'll let you know if it's going to be scheduled as a reminder. Additionally, posts scheduled as reminders will display a bell icon in the Queue.